Mix all ingredients except oil, with water make a dough. Heat oil in a pan , make the dough to any required shape . 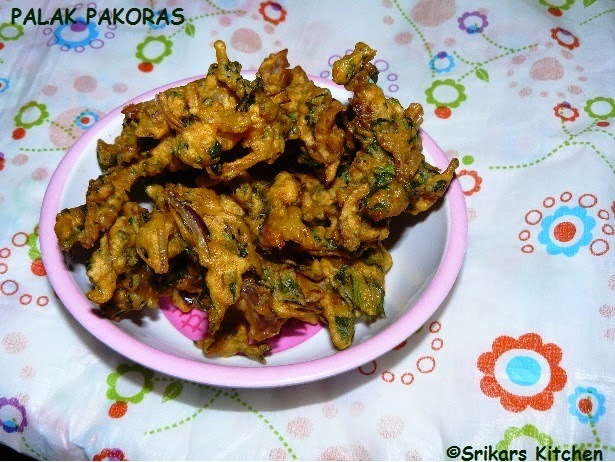 deep try until the pakoras crisp. simple and yummy bhajjis...Looking crispy..
Super delicious and a healthy snack item!!! Lovely snack. Looks crispy and yummy. Superb,simple and healthy bhajjis looks great! Fried snack with greens... too healthy! Looks delicious!! The bhaji looks crunchy and healthy .It is really simple. I have never tried before,thanks for the recipe! Nice snack for a rainy day. Looks so good. YUM! Simple and crispy, looks tempting ! Bajjis mae healthy! They look too god. perfect with tea! look so crispy nd yum,.. I tried these yest, oh these were too good with the flavours of onion n goodness of paalak, crisp on out, fluffy on the insides..just too good n a permanent snacking item added in the menu now on! :D Tks for sharing this unusual n lovely combo! Palak Pakodas as we call them...tastes so yummy with green chutney. I love this yummy snack.